Acclaimed Duo LOCASH to perform at the Kansas Star Arena on May 16! 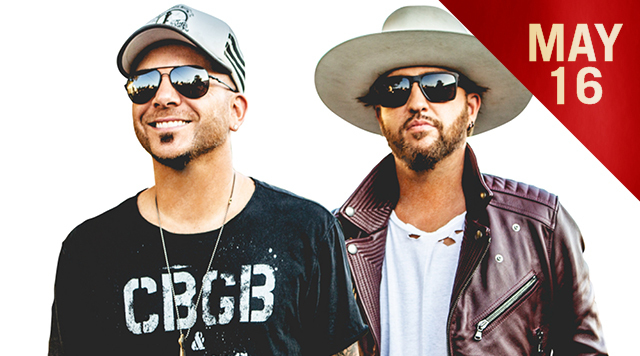 MULVANE, Kan.— Creating a sound that fuses modern country and classic heartland rock with an edgy vocal blend, LOCASH is the country music duo made up of singer-songwriters Chris Lucas and Preston Brust. With two albums and eight charting singles to their credit, LOCASH broke out in 2015 with their Gold-certified hit, “I Love this Life,” followed by the song “I Know Somebody” and 2017’s fun-loving romantic anthem “Ring on Every Finger.” Their latest single, “Feels Like a Party,” is the pairs first release with new label, BBR Music Group/BMG. The 2019 ACM duo of the year nominee is set to release their new album, Brothers on March 29, 2019.